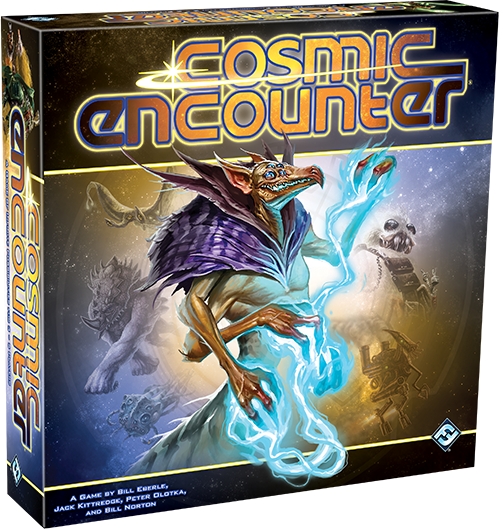 With Cosmic Encounter 42nd Anniversary Edition, you’re invited to step into the shoes of one of countless aliens and challenge your friends to see who can be the first to establish colonies on five foreign planets. Featuring a revised rulebook, a beautifully illustrated Quick-start Guide and other cosmetic upgrades, this edition brings the wacky, fast-paced world of Cosmic Encounter to a whole new generation of gamers. A fundamental aspect of this world are the game’s 51 alien species. Each one has its own unique power that interacts differently with all the others, making each game a wholly unique experience. 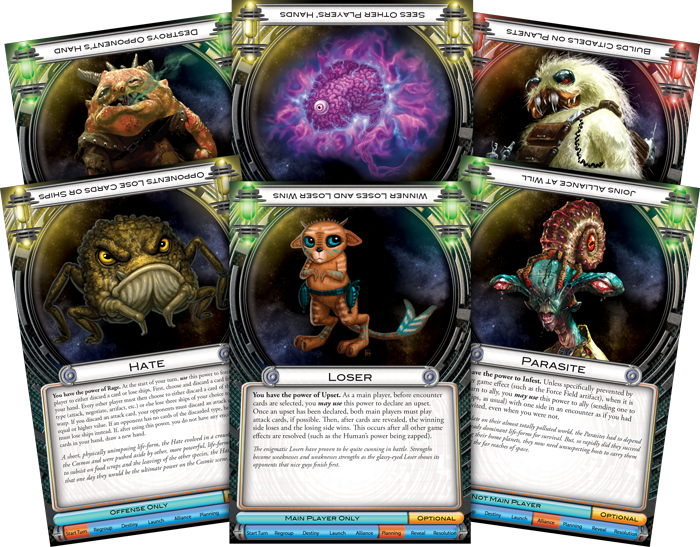 In addition to the other changes, the 42nd Anniversary Edition also includes a set of 34 brand new Cosmic Combo cards offering different mixtures of the game’s 51 aliens. 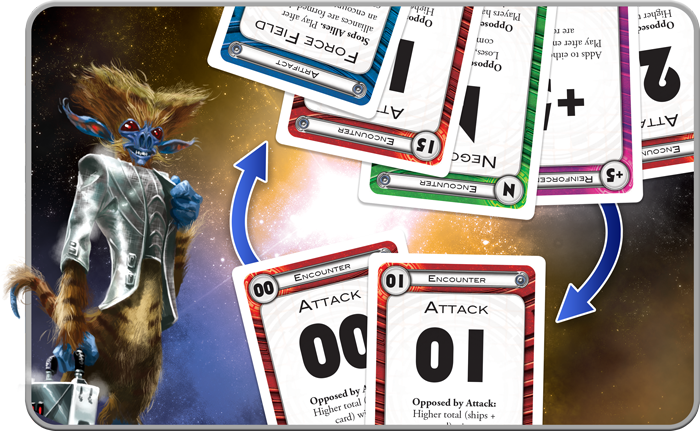 Each card provides a carefully selected list of aliens and brief descriptions of their powers, helping you quickly create themed matchups and explore wildly different types of games. 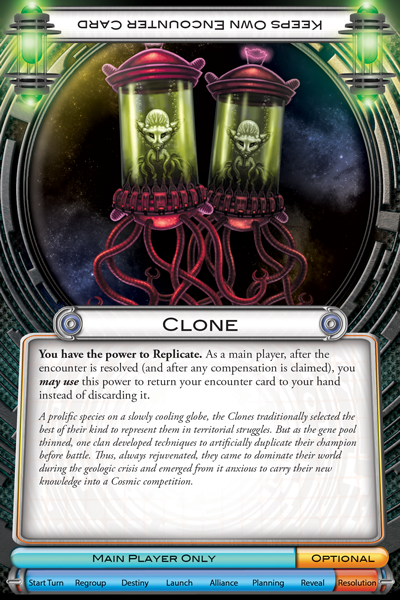 Join us today as we take a look at two of these cards and the possibilities they open in your games of Cosmic Encounter 42nd Anniversary Edition! Your games of Cosmic Encounter take place on an ever-shifting landscape, where deals are brokered, alliances are broken as easily as they're formed, and cunning play can be just as useful as brute force. Although encounters between two players are ultimately determined by the highest attack value, each player contributes by launching ships, playing encounter cards, forging alliances with other players, and adding reinforcements, so the interactions surrounding these encounters are rarely so simple. What's more, every alien’s power bends the rules of the game a bit in their favor and, when used properly, can help you secure victory. 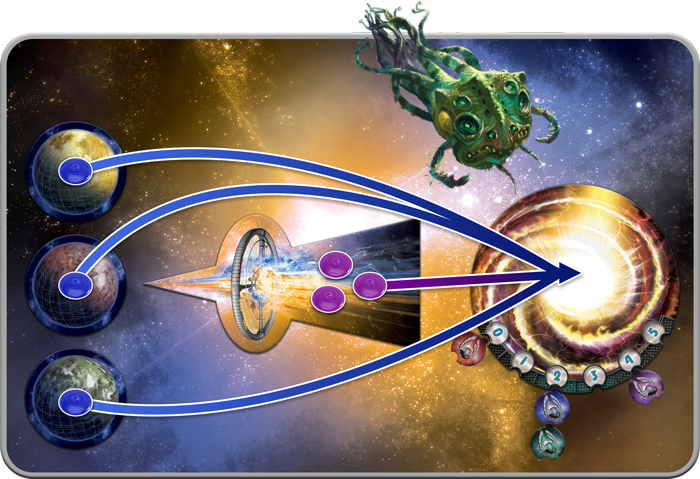 For players new to Cosmic Encounter, the Quick-Start Cosmic Combo card provides the perfect introduction to possibilities inherent in every game. The aliens on this card are straightforward and easy to understand while maintaining room for plenty of strategy. With the ability to make the winning side of an encounter lose and the losing side win, the enigmatic Loser immediately shake things up. 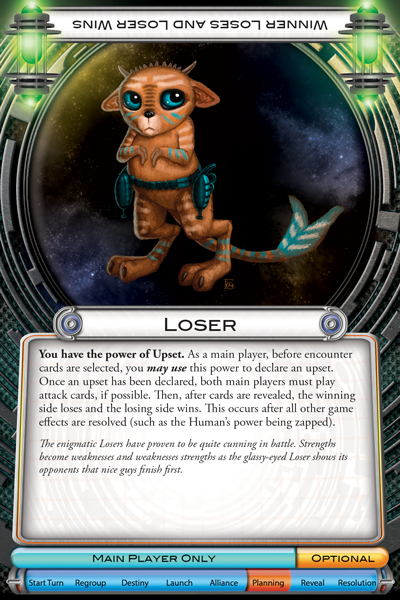 If the Loser declares an upset before encounter cards are selected, suddenly everything becomes a race to the bottom, with everyone hoping for the lowest total of encounter cards and ships. This ability gives the Loser a great deal of freedom to adapt their strategy to each encounter. If they’re hoping to lose, there’s no need for them to commit any more than a single ship, lowering the stakes if their attempt ultimately fails. But, if they have high-value encounter cards that can help them win, they can always see it through as normal. Furthermore, because the Loser does not have to declare an upset until after alliances are formed, they can keep their opponents even more off guard. The Loser may be adept at turning strengths into weaknesses and weaknesses into strengths, but their opponents in this game have plenty of ways to counter them. 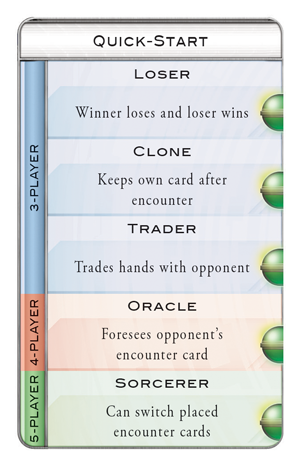 For example, the Trader could swap hands with the Loser just before selecting encounter cards, stealing away the low-value cards the Loser was planning on using to win the encounter. Similarly, as the Loser tends to like encounter cards with low values, the Clone can simply continue to replicate their attack card with the lowest value, forcing the Loser to find something lower or abandon their plans for an upset. 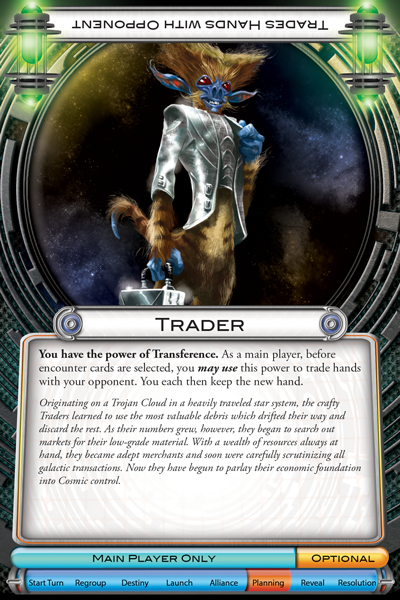 The Trader can use their ability to trade hands with their opponent before selecting encounter cards! Things become even more interesting when the game expands beyond three players. As cunning as the Loser may be, the Oracle can always stay one step ahead of them. These beings have developed perceptiveness about the intentions of others over millennia of civilization and can force their opponent to play their encounter card faceup. 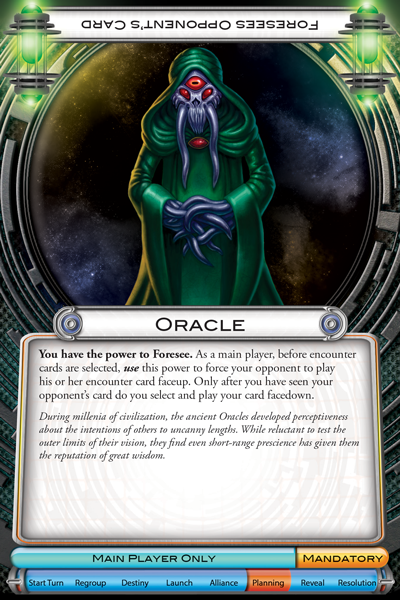 If they’re lucky, the Oracle will have the perfect card waiting to help them win the encounter. 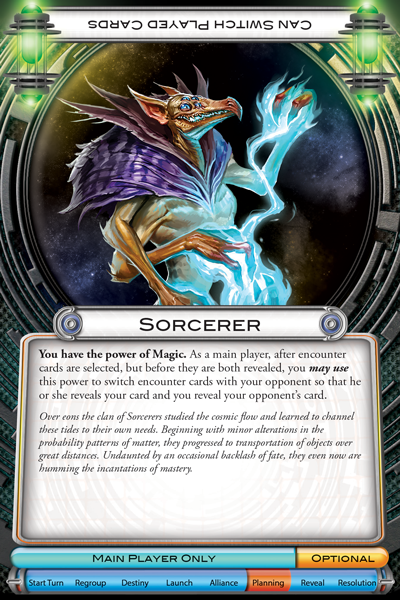 Similarly, although they don’t have the benefit of seeing their opponent’s encounter card, the Sorcerer can work their magic to switch encounter cards with the other player before they are revealed. Although, this will lead to the occasional backlash of fate, anyone playing against the Sorcerer must proceed with caution, knowing their encounter card could be taken from them at a moment’s notice. 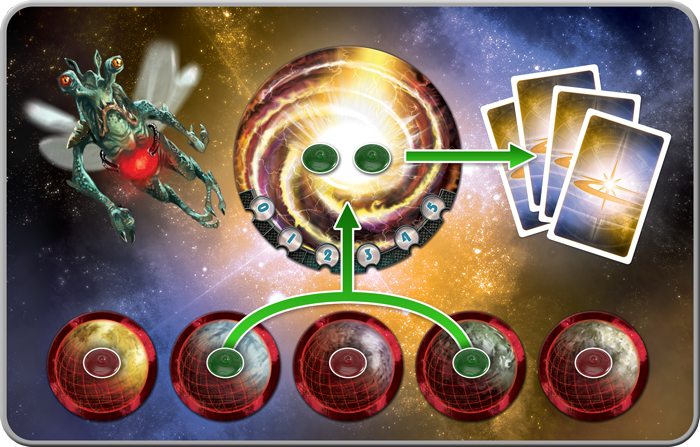 With a group of aliens that are easy to use and create many unique possibilities, the Quick-Start Cosmic Combo offers everything you need to take your first steps into the larger Cosmic Encounter universe. 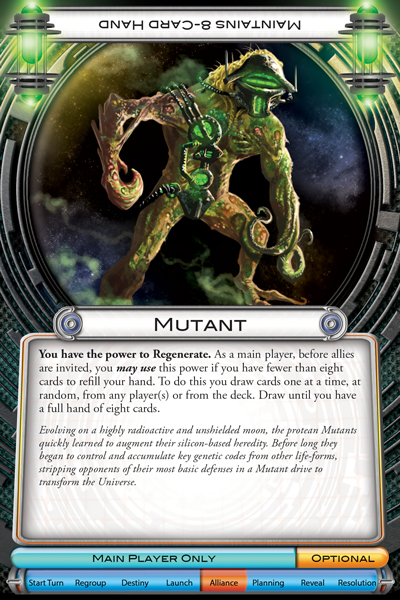 If you’re looking for an even more diverse mix of aliens and powers, you can always randomly select another Cosmic Combo card. With the Let's Go Crazy card, for example, you’ll find a mix of aliens who can play off each other’s abilities, creating all sorts of interesting dynamics. Everything begins with a pair of aliens who are almost never short on cards. Of all the aliens in this game, the Kamikaze might be willing to take the most extreme measures to secure cosmic dominance. They have raised the virtue of self-sacrifice to an artform and are willing to harm themselves in order to gain any advantage they can. 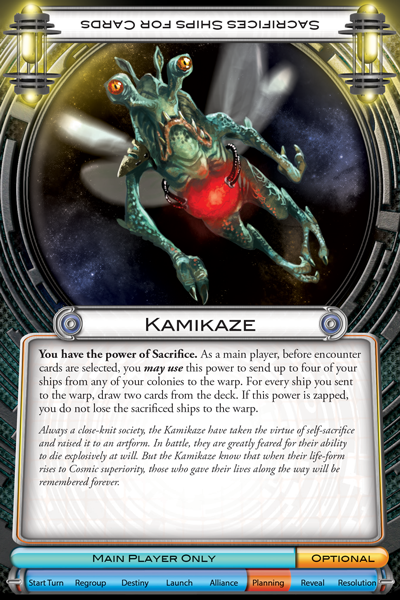 If they send ships from their colonies to the warp before selecting an encounter card, the Kamikaze will receive an influx of two new cards for each ship sacrificed. Although these ships will be sorely missed, their lives will be remembered forever if they help secure new colonies for the Kamikaze. The Kamikaze sends two ships to the warp, allowing it to draw four cards from the deck! The Kamikaze may have fistfuls of cards, but this won’t necessarily help them win against the Mutant. These beasts evolved on a highly radioactive and unshielded moon, quickly unlocking the secrets of the genetic code itself. With this knowledge, they can regenerate their hand back up to eight cards before inviting allies to join them. Crucially, these cards can come from both the deck and other players, allowing the Mutant to pull some cards away from their opponent or even take a few away from the Kamikaze. So, while the Mutant isn’t likely to make too many friends, their handful of cards will make them a more than worthy opponent. Cards are useful for winning encounters, of course, but you ultimately need ships to establish colonies on other worlds and the remaining three alien life forms all affect the number of ships the other players have available. Joining the Kamikaze and the Mutant in a three-player game, the Void are on a holy campaign to cleanse the heavens of all material beings. As such, they don’t just send an enemy’s ships to the warp when they win an encounter, they remove them from the game completely. After losing its encounter and ships to the warp, the Vacuum can bring along an equal number of other ships to the warp. 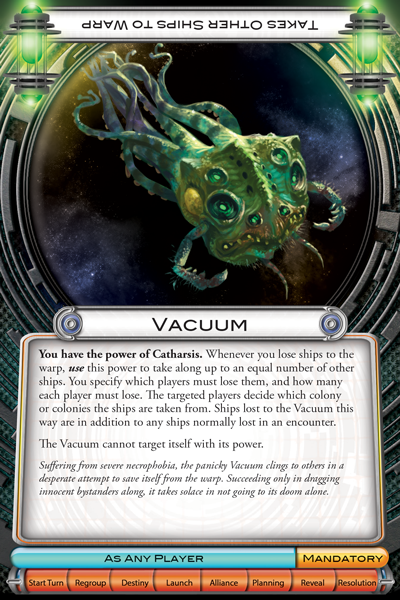 If the Void reducing the number of ships in play wasn’t enough, with four or more players you’ll also have to contend with Vacuum, who drags other ships along with it to the warp. 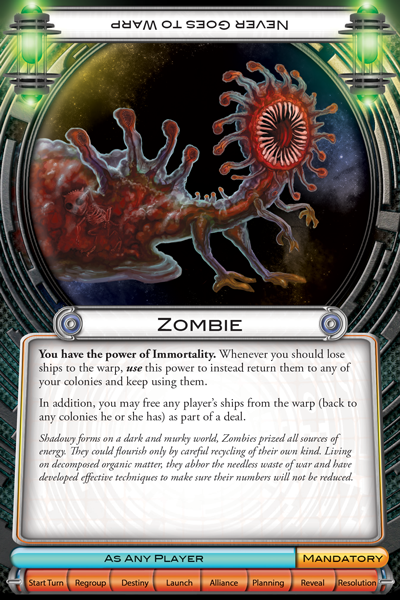 Of course, this means very little to the Zombie, whose ships never go to the warp, but are returned to their colonies to continue fighting to rule the galaxy. 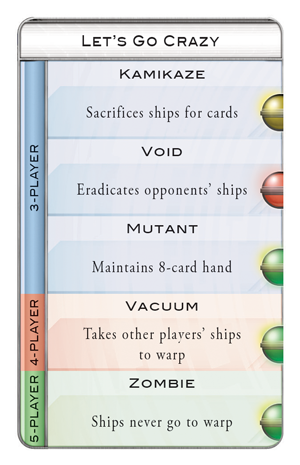 As an added bonus, the Zombie can free other players' ships from the warp, giving them exceptional negotiating power. The Zombie, however, is not immune to Void, who circumvents the warp entirely. 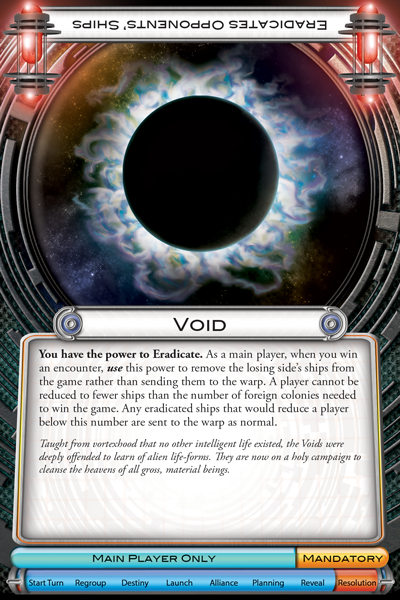 The result, as the name of this Cosmic Combo card indicates, is a wild game where nearly everyone will be short on ships, but has the potential to be flush with valuable cards. Thanks to the Precursors, countless alien species now wander the stars, seeking to prove their superiority. Tap into your civilization’s potential and prove that you are the true heirs to those that came before.